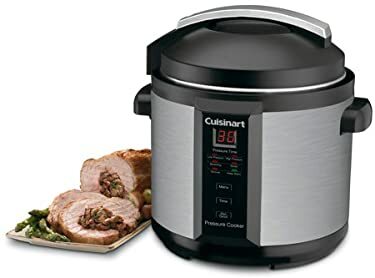 Introducing the Cuisinart CPC-600 6-Quart Electric Pressure Cooker, now in new and improved packaging. Amazon has worked closely with the manufacturer to improve the packaging on this item to ensure it will arrive on your doorstep in one piece. Reduce time spent in the kitchen preparing meals with the help of this 6-quart electric pressure cooker–it cuts cooking times up to 70-percent when compared to traditional stovetop cooking methods. The unit traps steam inside, which builds up pressure to create hotter temperatures, and its tight seal locks in heat, moisture, and flavor, as well as vitamins and minerals for exceptionally healthy, great-tasting meals like soup, chili, and other one-dish entrees. It also works well for cheesecake and custard, because dessert should never be left off the menu. The unit’s push-button controls and easy-to-read digital display eliminate guesswork, while its precision digital thermostat regulates temperatures. Choose from pre-programmed settings for high- or low-pressure cooking, browning, simmering, sauteing, and warming. For safety, the cooker must be fully locked for pressure to build, and it will remain locked until the pressure inside drops to zero. Other highlights include a 99-minute timer with an LED countdown display, cool-touch side handles, and a nonstick cooking pot that cleans up easily by hand or in the dishwasher. A dishwasher-safe trivet also comes included. Housed in brushed stainless steel, the 1000-watt pressure cooker measures 12-1/5 by 12-1/5 by 13-1/5 inches. Browning – This preset temperature allows cooking over high heat, without the lid, before pressure cooking. Browning foods in a small amount of fat in this way seals the outer surfaces of meats and vegetables, producing a visually appealing, flavorful exterior with a moist, tender interior. 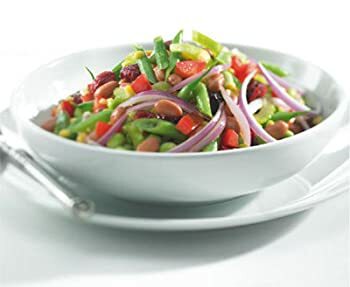 Sauté – The preset temperature, done prior to pressure cooking with lid removed, allows you to quickly soften vegetables in a small amount of fat or liquid without browning, and to cook items such as rice (Arborio, brown, Carnaroli, white, etc.) for pilafs and risottos. Simmer – This preset temperature allows you to cook liquids at a lower temperature. It is primarily used to finish cooking some items, i.e. to add ingredients to a risotto, sauce, or stew or to continue cooking process to achieve preferred texture. Keep Warm – Holds and keeps cooked food warm for up to 12 hours. Automatic Keep Warm Feature: When LED display reaches, the pressure cooker automatically shifts to Keep Warm temperature. The Keep Warm light will turn on and unit will beep to indicate cooking is complete. With the unit on and the LED displayed, press the MENU button to select the desired cooking function. The function light will flash. Select Low or High Pressure setting. Press TIME to select number of minutes needed for pressure cooking. Time increases in 1-minute increments up to 40 minutes. Time increases in 5-minute increments from 40 to 99 minutes. Press START/CANCEL to start cooking. The pressure cooker will begin to heat. The red float will rise as pressure builds. When the selected pressure level is reached, the light in lower right-hand corner of LED will stop flashing and remain lit. At this point pressure cooking begins and the timer will start to count down. The timer will not begin to count down until full pressure is reached, which may be several minutes after the red float has fully risen. Many family favorites can be easily adapted for preparation in your Cuisinart Electric Pressure Cooker – soups, stews, side dishes and more. The amount of liquid needed is much less than for traditional cooking methods. Never exceed the Maximum Fill Amount of the pressure cooker. Make sure the lid is on firmly and tightly, and moved as far counterclockwise as it will go to allow proper locking. Hot foods/liquids will come to pressure more quickly than cold foods/liquids. When pressure cooking is completed, follow recipe instructions for releasing pressure. For Quick Pressure Release it is important to begin immediately upon completion of pressure cooking; otherwise foods will continue to cook, and may overcook. Do not store pressure cooker with lid on tightly. This saves on gasket wear and tear. More nutrients are preserved during pressure cooking than with traditional cooking methods, as less liquid is used and thus fewer nutrients are lost to evaporation. To adapt your own recipes, find a similar one in our cookbook and use it as a guide. In general, cooking time will be at least 1/3 of the traditional cooking time. Reduce your cooking liquid by at least half – you may need to “play” with your recipe to get it right. You may wish to add vegetables at the end of cooking to avoid overcooking. You can also use the cooking charts provided as a guide.